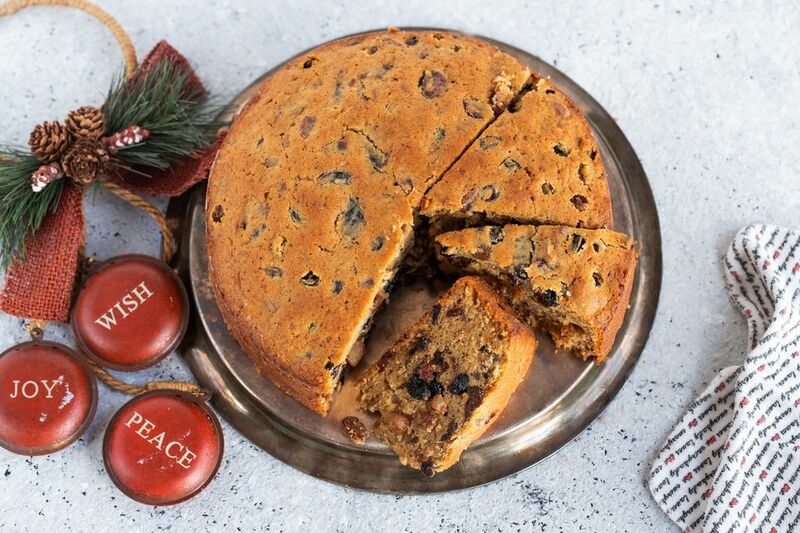 Christmas cake, black cake, wedding cake, and great cake are all names used to describe the famous Caribbean cake that is made with aged rum-soaked fruits. This is a cake that is made to mark the celebration of Christmas, weddings, christenings, baptisms and significant anniversaries. Each household and Caribbean island has its own version. This is my personal recipe that's been a success not just for me, but for many who've tried it. Preheat oven to 350 F with the baking rack in the middle of the oven. Grease the cake pan. Rub butter all around the insides of the pan, sprinkle with flour and swirl the pan to coat it with flour. Turn over the pan and tap to remove the excess flour. Line the bottom of the pan, only, with a cut-out piece of parchment paper. Set aside the pan. Cream butter and sugar until the mixture reaches a pale cream color. If using a hand-mixer, 5 to 6 minutes, if working by hand 20 minutes. Set aside. Sift together flour, baking powder, and cinnamon into a large bowl and set aside. Add extract or essence to eggs and continue to whisk until incorporated—about a minute. Pour whisked eggs into the bowl with the creamed butter and sugar mixture and stir gently using a rubber spatula. Keep stirring until incorporated. The mixture will look curdled; that's okay. Add the rum-soaked fruits to the egg-butter-sugar mixture and stir to fully incorporate. Add the flour-baking powder-cinnamon mixture gradually to the wet ingredients and mix gently but thoroughly to incorporate. Do not over mix or beat the batter. Pour the batter into the prepared pan; use the spatula to scrape all the mixture from the bowl. Lift the pan a little and let it drop back to the surface about 2 to 3 times, this is to remove any bubbles in the batter. Bake for 90 minutes or until an inserted skewer comes out clean. Remove pan from oven and let cool on a wire rack in pan for 10 minutes. At the end of the 10 minutes, carefully, gently and quickly invert the pan, removing the cake. Let the cake continue to cool on the wire rack until completely cool. To soak fruits, place them in a bowl with the rum and leave overnight, until they are soft. Then drain using a strainer and use in the recipe.